European Space History has just posted this awesome movie poster-like orange-blue launch photo of a historic space event that took place on November 26th way back in 1965. 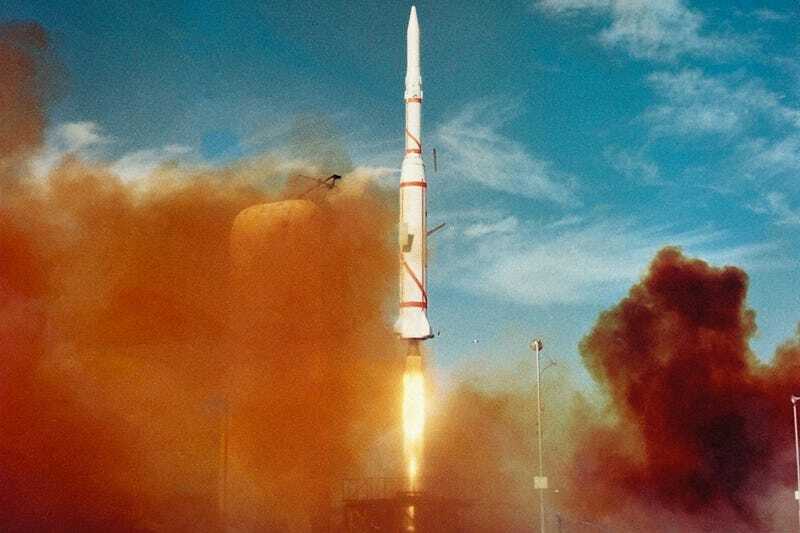 Fifty years ago, France launched its first satellite to low Earth orbit on a Diamant A rocket from the Joint Center for Special Weapons Testing of Hammaguir, Algeria. With this step, France became the sixth nation—after USSR, USA, Canada, UK and Italy—to have a satellite in orbit, and the third to launch its own. The military satellite was originally called A-1 (the French Army’s first satellite), but was later was renamed to Astérix, after the popular French comic character. The satellite reached it planned orbit, but its antennae were damaged during the separation of the fairing, so the satellite remained silent. Nonetheless, Asterix is still with us due to the relatively high altitude of its orbit, and is not expected to re-enter Earth’s atmosphere for the next few hundred years. Here’s the full shot of the launch.